Today marked the beginning of Dana Point's city festival, Festival of Whales, so to observe the occasion I went on the "Marine Mammal Cruise" this morning offered by the Ocean Institute (of which I am now a member). Despite the expectations, to everyone's surprise (including the onboard marine biologists) there was only one whale sighted--a juvenile Grey Whale leisurely heading northwards and coming up to breathe, at closest approach, about 100 ft. off the bow of the ship. As he dipped down under the water for the last time, he showed us his fluke (above photo). 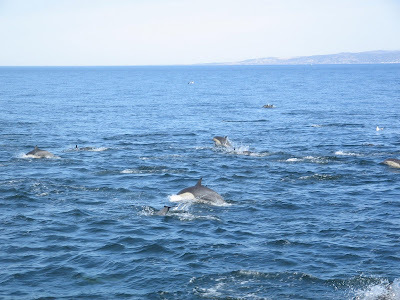 But by far the highlight of the trip occurred within the first 10 minutes--about a mile out to sea the captain sighted a pod of Common Dolphins--what he estimated was around 300 individuals! (Above photo.) As opposed to shy whales, dolphins actively approach the ship, because they like taking advantage of the currents and waves it creates--and so we headed over to them and they surrounded us like a swarm of bees. The usual descriptions of dolphins as intensely inquisitive and playful animals definitely applies here. They were gaily swimming, coming up for air, and sometimes jumping on all sides of us. 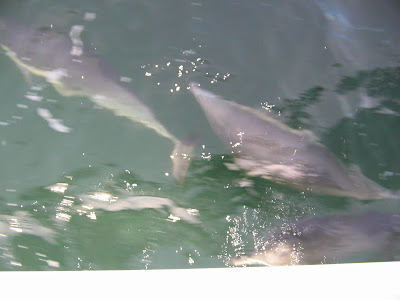 A particularly thrilling moment was when there were several dolphins swimming and breathing about six feet under my feet as I stood on the ship's bow, some of them juveniles and calves (below photo). As they swarmed us, the ship's captain spoke to the dolphins over the loudspeakers: "Man, I don't know what kind of coffee you guys had this morning, but I want some of it!" We left this pod behind and headed south. At about a mile northwest of San Onofre Beach (next to Camp Pendleton), the captain spotted a solitary pair of Bottlenose Dolphins a hundred yards ahead of us. Their solitary travel was something neither he nor any of the on-board marine biologists had ever seen before: dolphins usually travel in pods of tens or hundreds. Shortly thereafter, we encountered a small pod of Pacific White-sided Dolphins--numbering probably somewhere between 12 or 20. And as our finale, we got to see the one Grey Whale as described above--a juvenile (so, in other words, "small"... but that means about the size of a car!). 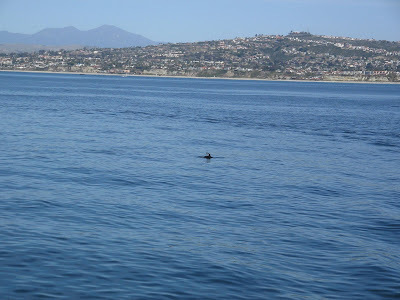 I did also spot a seal, probably a California Sea lion, just outside Dana Point Harbor. And the views of the landscape alone, as seen from sea, made the trip worthwhile: Santa Catalina Island, San Onofre Beach (with its incredible, dome-shaped nuclear power plant), the cliffs at Dana Point, the Santa Ana Mountains, even the snow-capped San Gabriel Mountains, to the northeast. I ask myself: why would anyone live anywhere else? I'm hoping that I will get to see even more grey whales when I go on this cruise again in mid-March, alongside my wife and our friends. 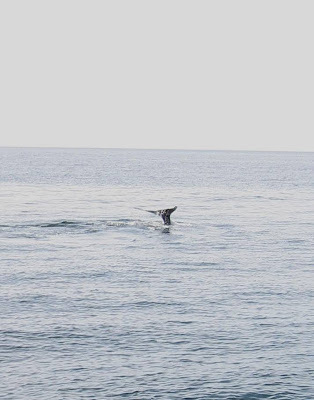 The grey whales have usually finished their migration (mostly from Baja California up to Alaska) by the end of March, although today I was told that it's sometimes possible to spot them as late as mid-May.